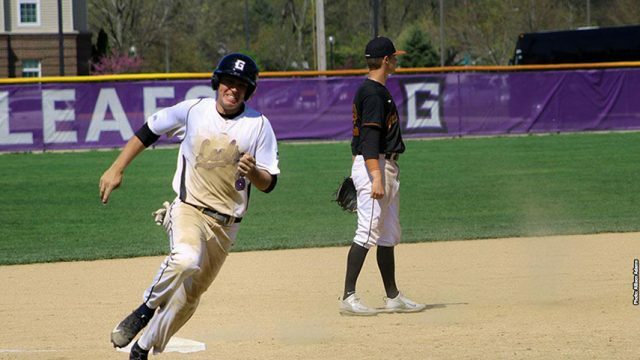 Sarge Yoder Field was on full display for the first time this season as the Maple Leaf baseball team took on the Pilots of Bethel College on Monday afternoon. A pitchers’ duel favored the Pilots as they captured their third conference win of the season by a score of 3-0. Sophomore Camm Nickell took the mound for the Maple Leafs for his fifth start of the year. The Middlebury native was in control early as he struck out four of the first six Pilots he faced including three consecutive hitters in the the second inning. However, the bats for Bethel didn’t stay quiet all afternoon. Three hits in the third inning, highlighted by an RBI double from Mason Love, turned into two runs for the Pilots. But before they could get any more insurance runs, Nickell struck out the final two batters. The Goshen offense looked for a response in the fourth, but a lone single from sophomore Bobby Garcia in the bottom half of the inning was unable to do the job as Pilot pitcher Justin Rasmussen fielded a ground ball for the final out of the inning. In the fourth, the Pilots would add the insurance run they were looking for on a two-out, RBI single from Kawambee Moss before Nickell sat down the final batter once again on strikes. This was a trend on the day as the top half of the Pilot lineup went 11-20 from the plate while the bottom half was unable to manage a hit, going 0-18. Goshen threatened on the offensive end in the sixth inning, putting runners on the corners with two outs, but to no avail as Rasmussen was locked in for Bethel, retiring the final batter. Rasmussen was too much to overcome for the Leafs in the end, as he recorded six strikeouts while walking one in nine scoreless innings of work. He was backed up by stellar defensive play as the Pilots didn’t record an error for the third time in a game all season. Senior Clinton Stroble II continued his fast start to the season as he recorded the lone extra-base hit for the Maple Leafs while going 2-4 on the day. Coming off his Maple Leaf Player of the Week campaign last week, junior Colby Malson stayed hot as he recorded three hits on four at-bats for the Maple Leafs. Nickell had 11 strikeouts in five innings of work on the day. Next, the Maple Leafs will travel to Indianapolis to take on the Marian University Knights in a three-game series. The first game will start at 4 p.m. on Friday with the final two games scheduled to begin at 1 p.m. on Saturday.